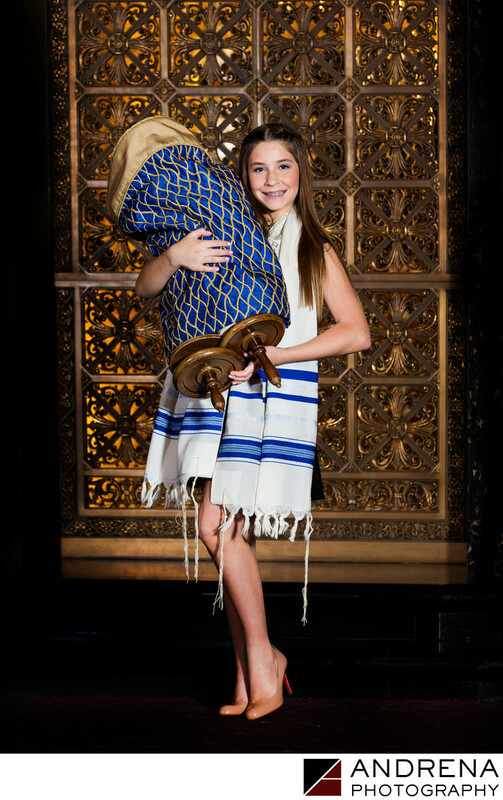 In this portrait, a Bat Mitzvah girl proudly holds the Torah at Wilshire Boulevard Temple. Seeing as how this congregation traces its roots to the first synagogue in Los Angeles, which opened in 1862, there is no doubt that this is a special and historic place to become a Bat Mitzvah. With the temple's many educational and social outreach programs, and a devoted group of congregants helping each other keep old and new traditions alive, Emily is set up with a wonderful support system and a caring community to inspire her as she enters this phase of Jewish life. She looks confident, ready and poised for wherever her journey into adulthood might take her. As photographers working in the Jewish community throughout Southern California, and in Los Angeles and Orange County, we are delighted to have had the opportunity to photograph so many important mitzvahs for families in the area. Location: 3663 Wilshire Blvd, Los Angeles, CA 90010.